Clear Braces - Straight Teeth In Less Time. Do you have misaligned teeth that make you feel self-conscious or unhappy? Many of our adult patients assume that the only way to have a straighter smile is with traditional braces, which use attractive metal brackets and wires. However, that’s not the case anymore. Many adults spend their entire lives covering their mouths when they laugh, smile or talk. They feel stuck because they do not want to wear metal braces for years or they are concerned that other corrective procedures could be too invasive or too expensive. Now, there is an effective, safe and affordable cosmetic solution that fits your lifestyle offered by Dr. Linger. 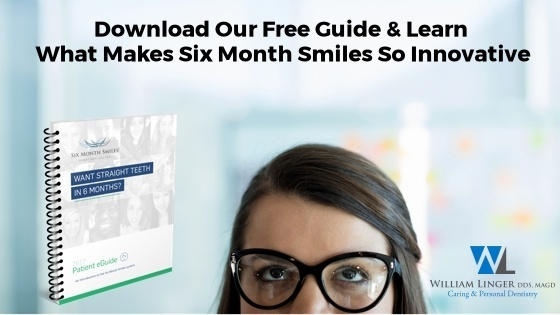 The revolutionary combination of proven orthodontic techniques and modern materials– Six Month Smiles® uses specialized clear braces to gently straighten and align teeth in an average period of just six months. With a solution like Six Month Smiles from Dr. William Linger, DDS, MAGD, adult patients (and kids) who want to straighten their misaligned teeth can finally enjoy faster and more discreet orthodontic care in Charlotte, NC. What sets Six Month Smiles apart from other orthodontic solutions? The biggest difference between Six Month Smiles and traditional braces is how long it takes to complete treatment. Straightening teeth with traditional braces can take anywhere from 12-18 months to complete. 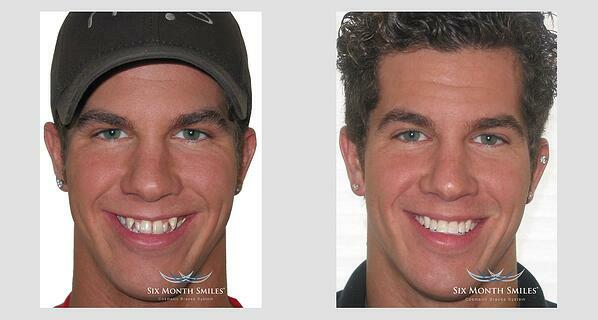 With Six Month Smiles, it really is possible to achieve the results you’re looking for in only about 6-8 months. This makes them a great option for adult patients who have a major event coming up, like a wedding, a career change, a family reunion, or anything else. In just half a year’s time, Dr. Linger's Charlotte-area patients can get their important orthodontic care out of the way so that they can move forward with a beautiful, dazzling smile that will improve confidence and even oral health. The second difference is that Six Month Smiles uses clear brackets and tooth-colored wires. That’s something that will have a special appeal to image-conscious teens and adults who have avoided care because of fears over how traditional braces look. With Six Month Smiles, you don’t have to worry about attracting attention to your treatment. They blend in more naturally with your teeth, making them virtually undetectable and allowing you to follow your normal schedule with confidence. Are you one of the millions of adults who need adult braces and who are unhappy, or self-conscious and embarrassed of your smile? Many adults spend their entire lives covering their mouths when they laugh, smile or talk. They do not want to wear adult metal braces for years or they are concerned that other corrective teeth straightening procedures could be too invasive or too expensive. Now, there is an effective, safe and affordable cosmetic braces solution that fits your lifestyle and gives the great results you expect and require. What Is The 6 Month Smiles Treatment? 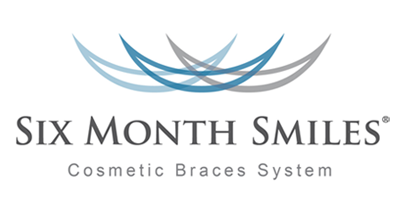 Six Month Smiles utilizes the best aspects of braces and has modified the treatment and the materials to give adults a common-sense, cosmetic solution that fits your lifestyle. Here is what makes Six Month Smiles so innovative. Try The 6 Months Smiles Online Assessment Questionnaire! Is Six Month Smiles® right for you? The best way to find the answer to that question is to contact us and schedule a consultation. However, by answering the following six questions related to your lifestyle and your expectations we can help you determine if you should consider taking that next step. The Six Month Smiles online assessment tool is not meant as a replacement for a consultation with a Six Month Smiles provider. Only a provider can tell you for sure if you are a candidate for this innovative treatment. Feel free to print the final results page of your assessment and bring it along with you to your Six Month Smiles consultation.